October 14, 2013, 8:30 a.m.
And, the most wonderful blessing we've ever been given. Congratulations. 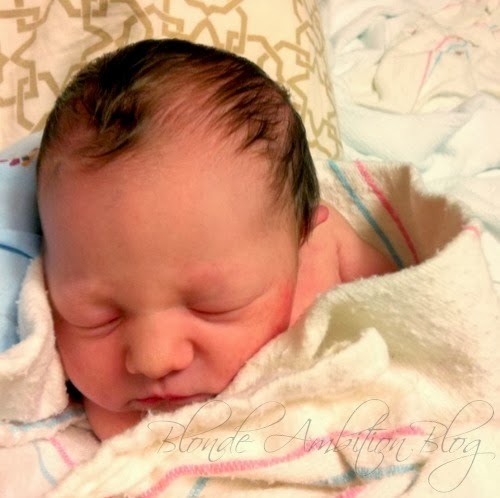 I follow your blog... love all the things you have to say... and thrilled to see Caroline has arrived (and is healthy!) Best wishes to you all!! Congratulations! What a beautiful baby girl! So happy for you and your hubby! Congratulations!! Been waiting for a pic :) She's absolutely beautiful! She is adorable mamma :) Cannot wait to see many more photos of her..
Congratulations! She is beyond perfect. She's beautiful! Congratulations on your new family of three!! Congrats! What a beautiful lady! Congratulations! Being a mother is the best blessing of all - enjoy every second of her! She is beautiful! Congratulations to the both of you. I saw a picture Monday where she is giving the camera a mean side-eye :) She is just so beautiful and I am absolutely THRILLED for you and Stephen! Congratulations a thousand times over! She is beautiful !!!! Congrats :) Many fun days ahead ! Being a mom is the BEST !!! LOVE this sweet baby's picture already! You are such a blessed mama! Congratulations! She is beautiful! I love your blog and can't wait to see more baby pictures. Congratulations on your beautiful new addition to the family. Enjoy this time, it goes by way way too fast. Gorgeous and such a blessing indeed! Welcome to parenthood, enjoy the ride!! What a precious girl! She's absolutely beautiful. Congratulations! Congrats! She is just precious! Congratulations, sweet Leslie! Caroline is beautiful:) Welcome to motherhood!!! Congrats Leslie!! I was actually looking forward to this post all week... hahaha kind of pathetic! But, I'm glad you had a healthy pregnancy and now a beautiful baby girl! She's sooo adorable!!! Congrats to you both on your baby girl! Congratulations! What a beautiful girl and a beautiful name. Your baby girl and I share the same birthday! Congratulations from Turkiye We pray she will grow up with her mother and her father all healthy and happy! Yay! Congrats on your sweet pea! Congratulations!!!! Just beautiful, of course. Enjoy this time!